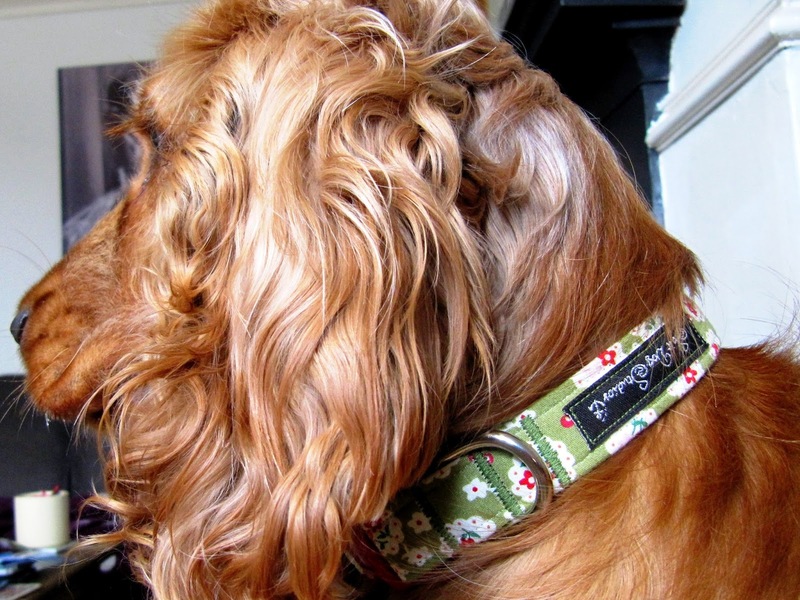 Hooman went weak at the knees recently when she (me) received a collar to review from Salt Dog Studios. I have more collars than is respektababble for a dog - seriously, I have a "working wardrobe" of about 15. I will tell you all about it in a future post. 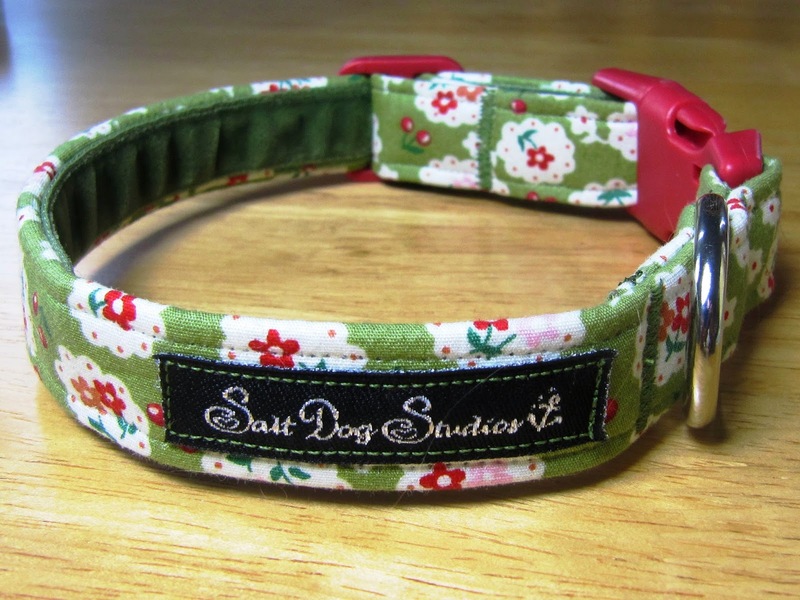 So the fabulous Salt Dog Studios sent us this gorgeous fabric collar. Salt Dog Studios are a small family run business based in Whitstable, Kent (England for my overseas buddies!). They offer purely handmade products using the highest quality fabrics and materials, and strive to offer great service and luxury items, for an affordable price. Hooman was bowled over by the care they took over a review product. They stitched it especially for me (I'm a strange in-betweeny size), and chose a collar they thought would match my colouring, plus a handwritten note to ME! Hooman loved it. 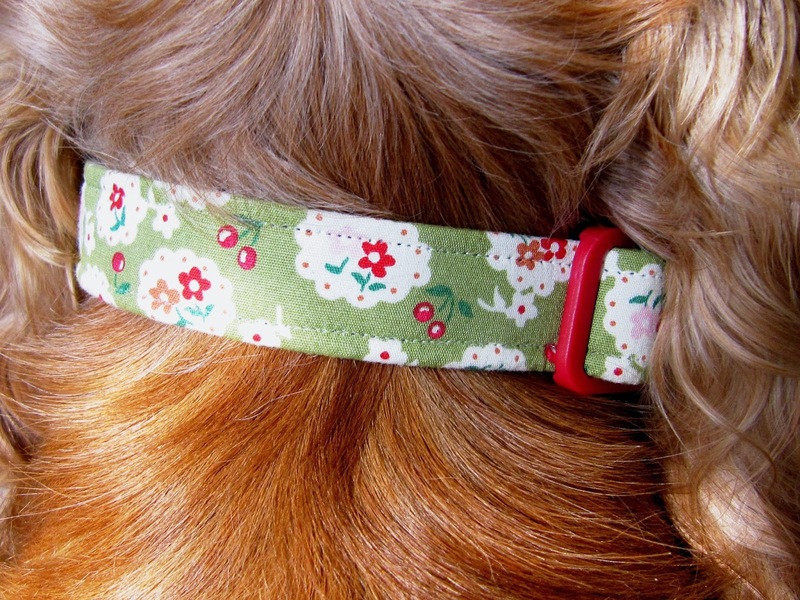 The collar itself is the Betsy Green collar from their Fabric Collar range. Now, as I've told you, Hooman is a collar expert, and she was very impressed by this one. It is a beautiful dainty fabric (Hooman thought this particular one was very Cath Kidston-esque), but that is the only dainty thing about it. It is very robustly made - a good sturdy buckle and D-ring, the collar itself feels hard wearing, with a webbing core for strength, plus it is lined with velvet for comfort which is a nice touch. Lastly, all their collars are washable at 30 degrees - very important if you are a mud hoglet like me! Top marks all round. Salt Dog Studio collars come in a variety of widths, sizes and styles (as well as fabric, there are ribbon and hemp collars), plus they can customise collars into half checks, or add different buckles on request. They also do a wide range of other products including leads, harnesses, bandanas, cat collars, and accessories for you and your home. 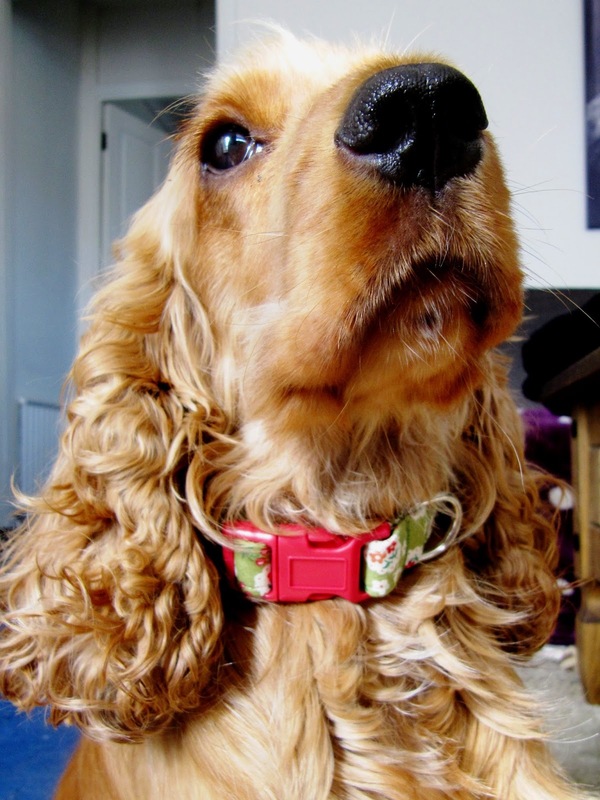 This particular collar in my size is £15.99 - prices for collars range from £9.99 for teeny-weeny, upwards. They are also running a special summer offer at the moment - 15% off all orders over £30. Enter the code SUMMER14 at the checkout - ends 31/07/14. To browse their lovely range of products, click here. PS. I don't have a tag on in these photos, but I was in model-mode. Please ensure you meet legal requirements and always have a tag on your dog when out and about! That sure is a pretty collar you have there Lottie. We'll have to check it out. I'm not as fashionable, but my sister Maggie is. What size is your collar, Lottie? You look about the same size as Penny. 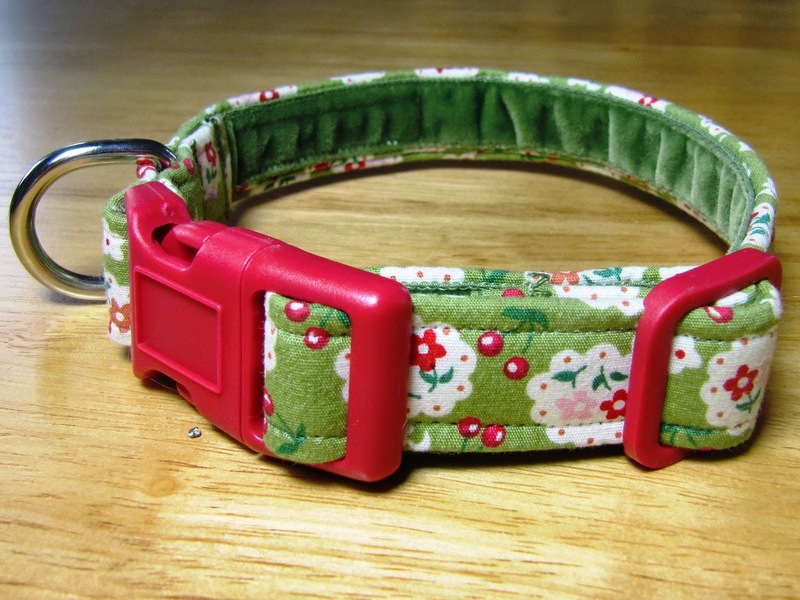 Your new collar is fabulous, Lottie! It sounds like your hooman is as nutty about buying collars as our mom is. We're off to check out your Salt Dog link! Very pretty. We got some nice personalized custom dog collars from www.hotdogcollars.com They say The Daily Bone on them and weren't expensive at all. Lottie, you look gorgeous in your new collar. The colors are so pretty against your long, luxurious ears. I think that I could look at photos of you all day! Hey! You're on Instagram! I'm going to go click your icon and follow you. YES!! That's a very handsome collar. Stop by tomorrow, Mischief Monday and pick up your Shine On Award. You look perfect in your new collar! Can't wait to see your collection!! I love the idea that it's so gorgeous--and washable. That's important. What a beautiful collar! I was just saying to my hubby today that the dogs need some new collars....our collection is pretty small compared to your 15!